To the iconic Marcel Breuer Mid-Century Modern stone house the current owners added a glass and steel wing designed by award-winning architect Toshiko Mori. NEW CANAAN — Internationally renowned 20th century architect Marcel Breuer, who lived at 628 West Road, began his prodigious design career in Germany’s Bauhaus as a student and later as head of the furniture design workshop. The website for The Art Story called Breuer one of the most important architects of the modern age and said his influential “career touched nearly every aspect of three-dimensional design, from tiny utensils to the biggest buildings.” Before he was commissioned to design his iconic structures - including the UNESCO headquarters in Paris, the former Whitney Museum of American Art building in New York City, and several Mid-Century Modern houses in New Canaan and elsewhere, Breuer gave the world an iconic chair. “Breuer’s Wassily Chair became an instant classic of modern design, and even today it remains one of the most recognizable examples of Bauhaus design. For this chair, he used the newest innovations in bending tubular steel for the entirety of the structural frame, thereby demonstrating the possibilities of modern industry applied to everyday objects,” according to www.theartstory.org. 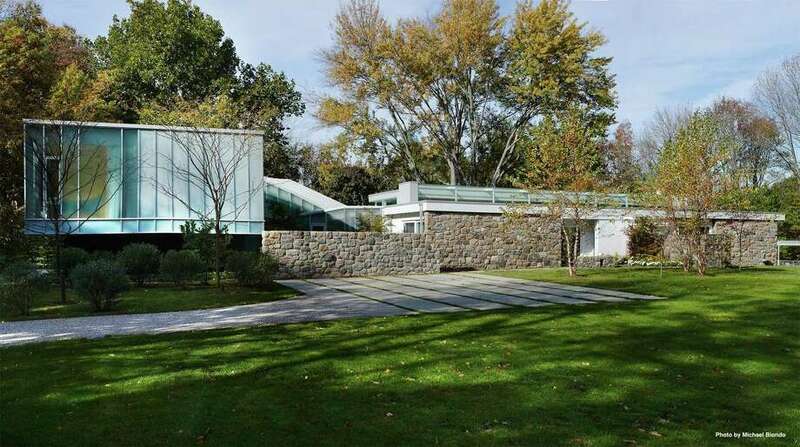 The acclaimed designer approached architecture with the same innovation and examples of his design principles dot the New Canaan landscape including the West Road house he built for himself and his family. This house is as comfortable to live in as Breuer’s Wassily Chair is comfortable to sit in. Breuer, one of the Harvard Five, built the house in 1951 and lived there until 1974. “The Harvard Five architects, along with other mid-century modern architects, not only designed homes for local residents but chose New Canaan as a place to live and raise their own families,” said Nancy Geary, executive director of the New Canaan Historical Society. “These exquisite jewels perfectly sited in their natural surroundings - many of which still remain - not only enhance the visual landscape of this community but remind us of the key role New Canaan played in modern architecture. We are fortunate that people today still appreciate these sensibilities and want to preserve these masterpieces,” Geary said. Subsequent owners have made their own renovations. The interior of the house was essentially gutted in 1976, according to material provided by the listing agent. The swimming pool, underground stone pool house, guest house and greenhouse were added in the early 1980s. With great sensitivity to Breuer’s original design, the house has been masterfully restored and expanded by the current owner in partnership with award-winning architect Toshiko Mori, who is the Robert P. Hubbard Professor in the Practice of Architecture at Harvard University Graduate School of Design. She chaired the Department of Architecture from 2002-2008. Preserving the design integrity of Breuer’s original home Mori designed a steel and glass addition expanding the footprint to the 4,777 square feet, and incorporated 21st century features including a luxury modern Snaidero kitchen, radiant heated stone and bamboo flooring, and 11’6” ceilings on the main living level. Mori also designed a sun deck for the pool house, which has a kitchenette, full bath, and wine cellar. Quennel Rothschild & Partners designed the landscaping, which is illuminated by Linnea Tillett Lighting Design Associates. The house has 11 rooms including four bedrooms, all en suite, one fireplace in the living room, which is open to the dining room and kitchen. Walls of glass invite the serene setting inside and provide attractive views of the manicured gardens and woodland surroundings. A long row of glass on the ceiling allows the ever-changing sky to be part of the interior design, creating natural art on the ceiling. Several rooms have doors to the patios, grounds and gardens. For more information or to make an appointment to see the house contact Sherri C. Kielland of Houlihan Lawrence at 203-977-3566 or skielland@houlihanlawrence.com.